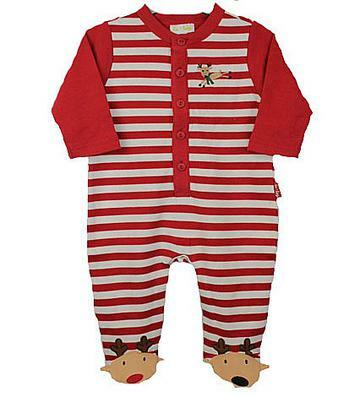 This adorable red and white striped coverall footie is ready to be worn for Christmas. There is a reindeer stitched on the left part of the chest and the sleeves are solid red. The footies on the coverall are two reindeer, one with a red nose and one with a black nose. There is five buttons down the front and snaps on the inside of the legs to change diapers easily. This soft outfit is 100% combed cotton.